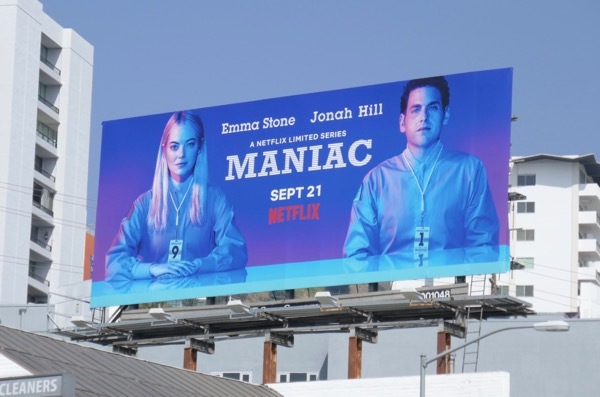 Netflix continues to attract big stars names for its latest limited series, this time snaring Emma Stone and Jonah Hill for Maniac. 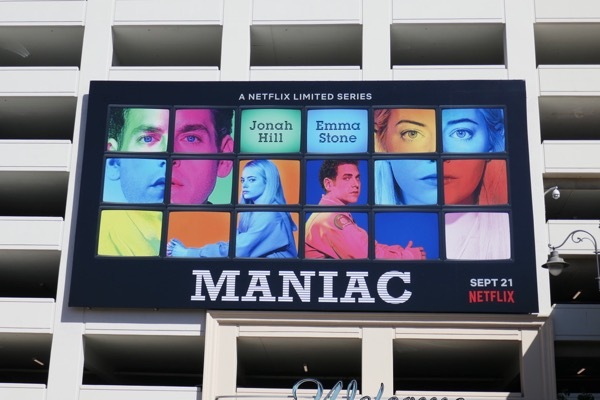 Directed by new James Bond director Cary Joji Fukunaga, the mini-series follows two strangers who are subjects of a mind-bending pharmaceutical drug trial to help with various mental illnesses. 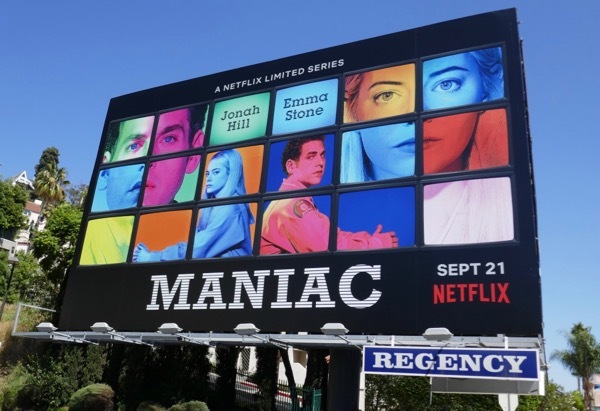 The trial causes them to experience different characters and settings drawn from their subconscious minds, their memories, fears and imaginations. 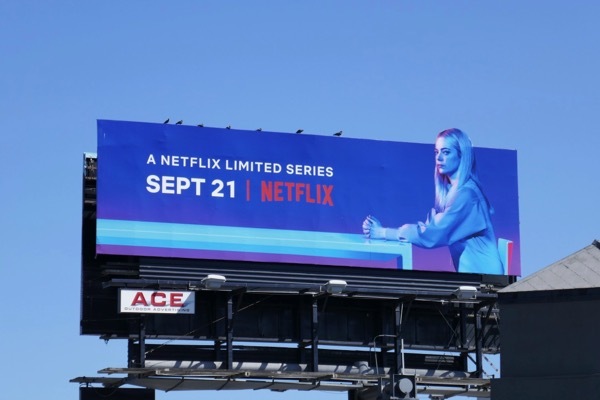 The dark comedy-drama on the streaming service is based on the original 2014 Norwegian TV series of the same name. 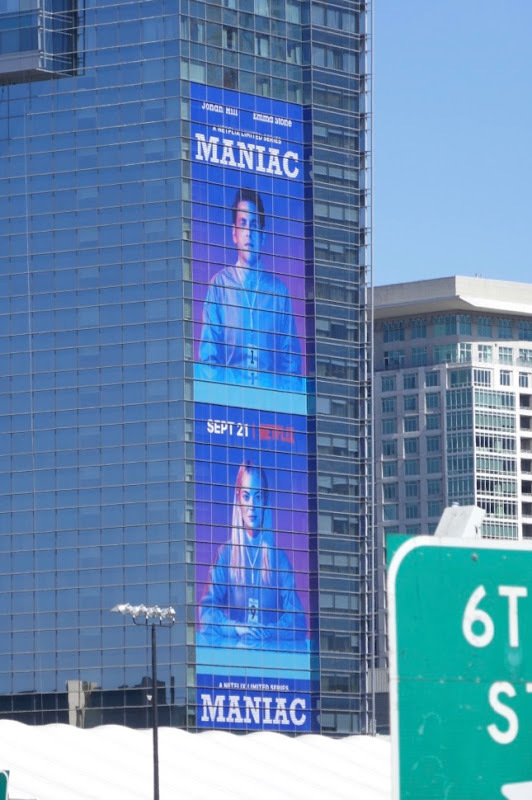 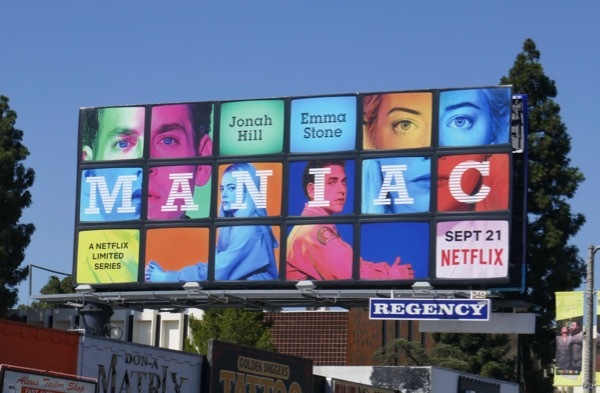 These colourful Maniac billboards were photographed along Santa Monica Boulevard, Melrose Avenue, Sunset Boulevard, 3rd Street, DTLA and at The Grove from September 18 to September 24, 2018. 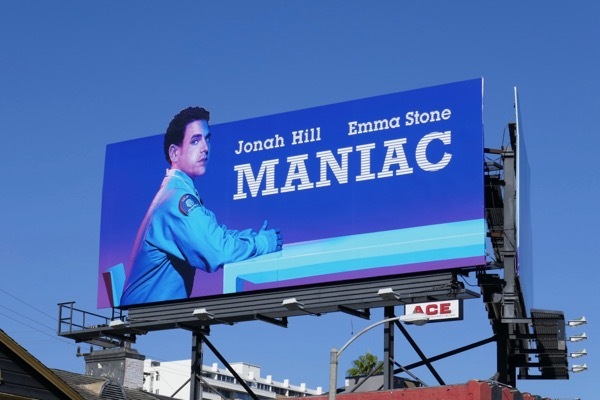 Fans of Jonah Hill can also check him out in these War Dogs movie billboards, these 21 and 22 Jump Street movie billboards, these film billboards for The Wolf of Wall Street. 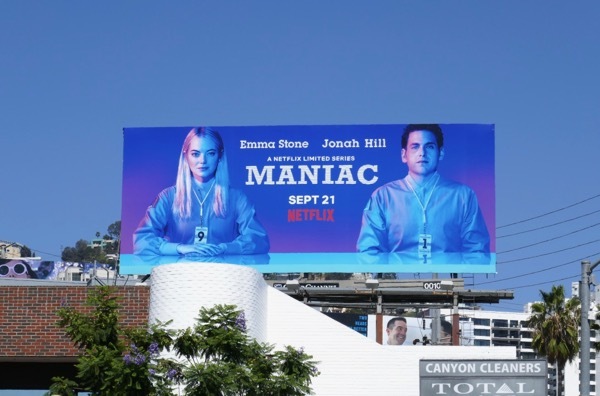 Meanwhile Emma Stone admirers can enjoy these La La Land movie billboards, this giant Revlon cosmetics billboard and these movie billboards for The Help. 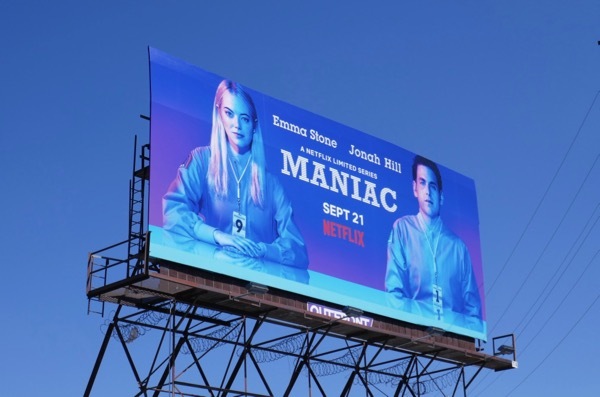 In the crazy world we live in at the moment, a bit of escapism into different fantasy worlds could be just the tonic you're looking for. 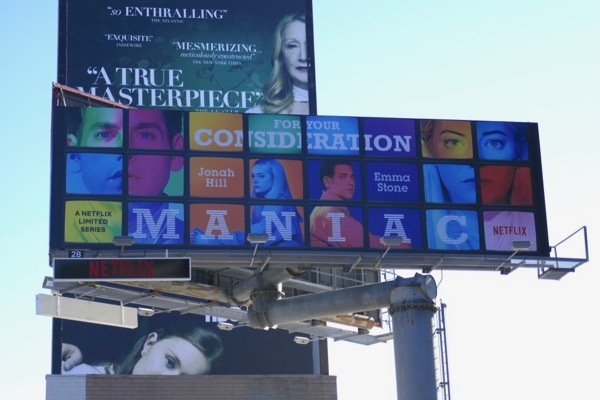 UPDATED: Here's also a 'For your consideration' billboard for the limited series snapped along the Sunset Strip on November 14, 2018, hoping to catch the eyes of Golden Globes, SAG Awards and entertainment industry voters. 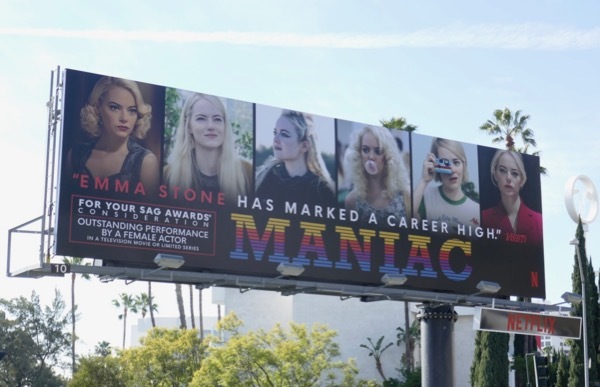 UPDATED: Congratulations to Emma Stone for garnering a Screen Actors Guild Award nomination for her many roles in Maniac. 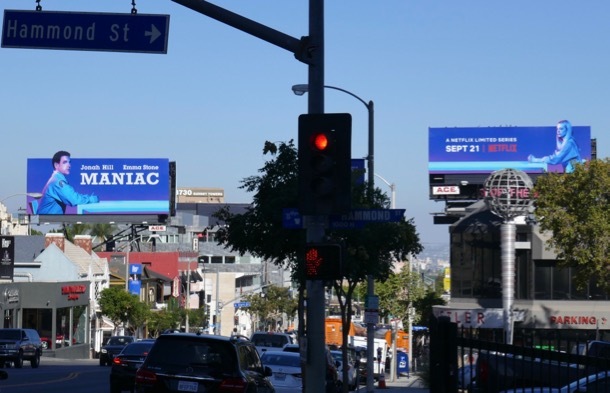 This nominee billboard was spotted along the Sunset Strip on January 9, 2019. 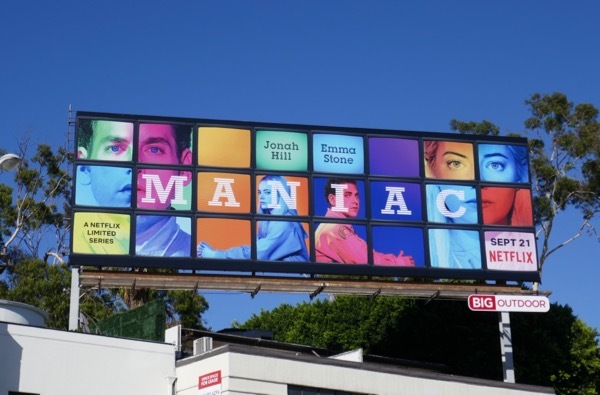 Here's another example of this SAG Award nominee billboard spotted at Fairfax Avenue and Beverly Boulevard on January 18, 2019.